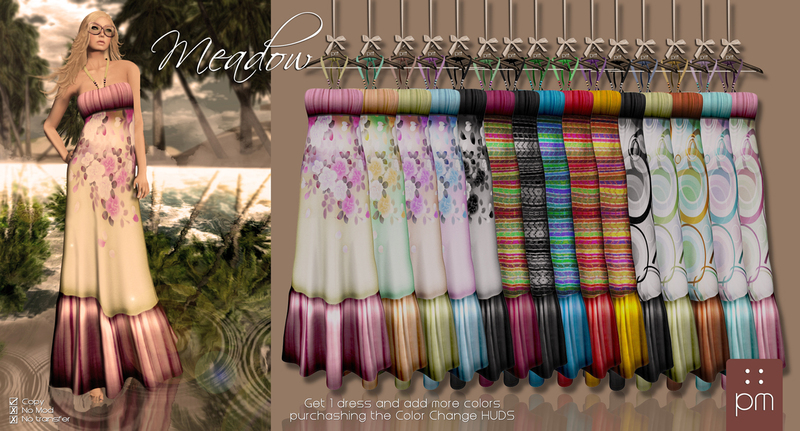 Meadow, a Spring-Summer release | ! *PurpleMoon Creations* ! Meadow is a mesh maxi dress in 15 delicate and fresh colors. We divided the collection in three groups, Circles, Stripes and Floral and we come up this time with a new system to avoid some clutter in our inventories when we purchase more than one color or fatpacks. Now the textures can be changed by a very simple HUD! So you only need to purchase ONE dress and then if you want more options get the HUD of your like! There is a DEMO available that explains it better than I can, so please TRY IT!